A few brief words on this week's regular edition of Righteous Indignation. I'll be up front. The show is worth the listen. These guys (and gal) are becoming real pros at this podcasting thing without it changing the basic chemistry of the show. It's not that the show is perfect. It is English, and like in their country's military excursions throughout history, there is some muddling through at times, but in the end they do their monarch proud. Before I get to the episode's guest, one of the various topics discussed on the show was "R.E." or religious education in English schools. As an American unless you went to a religious-based school, as Lady did, and went to a public school like me this whole religion class in school sounds just bonkers. It's church in the state. If one goes to a nice Catholic school as did the wife or my mom (mum for you in Britain or Australia) and they did you all sorts of myth and moral codes that are rather questionable to me that's ok since that's what your parent/guardian is paying for at least in part. You'll likely turn out all right except you may end up with a guy like my dad or I.
I do like Trystan's idea of R.E. being a more comparative religions class. In fact, I have always thought if you could hoodwink it into American schools as a philosophy class it would be a way to undermine religion. Showing students (or in Britain pupils) all the various beliefs of the numerous religions in history and currently could convince some that religion is not cracked up to what the preacher, priest, rabbi, swami said it is. Also, religion is such a hot potato (hot pudding in Britain) issue in the states that schools go out of their way to avoid teaching the cultural and historical significance of religion on modern society. Once again the Indignates have picked a topic to make me think, and I believe the reader too. The guest was Big Foot researcher Paul Vella, who by day is a forensic computer expert with many hours of court testimony to his credit. Vella seems to be a completely normal competent thoughtful person, and I would not be surprised if he is a highly regarded and sought after expert. The conversation had between the Indignates and Vella was quite civil and polite. Yet, in the end I just think that despite his considerable skills Vella is doing a very good job rationalizing why no Bigfoot or Bigfeet have been discovered. There are hundreds of sightings a year, and many are from reliable people. 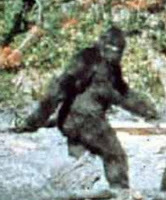 Many of the reported sightings are brief and fleeting and not over the top with Bigfoot hanging out in your garage trying to steal a case of Bud Light. Why have we not found any corpses? There have been polls of park rangers and none of them ever ran across a dead bear, so why would they find a bigfoot? People have found dead bears in the woods. I ran into a dead deer once. Why not a Bigfoot? Where Bigfeet are is a lot of wilderness. It is easy to hide in a large, I mean really large, wooded area. Bigfeet have been spotted in Pennsylvania, and we have a lot of woods in the Pennsyltucky part of the Commonwealth, but during hunting season when you can't toss a rock without hitting a person carrying a Winchester for a month in late fall no hunter has shot a Bigfoot by mistake rather than their mother-in-law by mistake as is the norm. Bigfeet have been spotted in 49 of the 50 United States, but for Hawaii. I don't know how this helps his case. It is more of a range for a Bigfoot to be found or captured. They spotted a Bigfoot in Rhode Island. You get on a tall hill and see the entire state, and no Bigfoot has been captured. This is not to say I can prove a hair hominid does not exist. It might be possible, but so highly improbable given modern population growth, the ubiquitous-ness of cameras, and guns in the States, such that it is hard to believe that someone has not appeared with a real dead Bigfoot. I would love to find out Bigfoot was real, but I find it a highly dubious proposition. The Indignates asked all the right questions, and Vella gave all proper answers for one carrying the torch for Bigfoot and was not a complete loon or unstable. This is what made the interview so interesting, that Vella has all the evidence before him and can still come out that a big hairy bi-pedal creature is reasonably likely to be roaming the hills of America, Canada, etc. I would love to hear Vella in a discussion including Blake Smith, of Monster Talk, perhaps in a "Token Skeptic" style discussion. On Point of Inquiry, the author of the What's the Harm website, Tim Farley was interviewed by Karen Stollznow. It was a pleasant enough interview. There was nothing blockbusting discussed, but Farley is an affable enough fellow who really has found a useful web niche in the skeptoshphere. In fact I used it today to find a horror story about ear candling after someone at work suggested I use ear candling to treat an earache. Bingo! Found a story of a woman having hot wax painfully dripping onto her ear drum. Farley gives advice to those looking to start skeptical websites of their own, and discusses how he wants to increase skeptical placement on Google searches. He shares how he came up with his site, and his trepidation in releasing it to the public. It was a nice interview. I suggest it, but I'd listen to the Indignates first just to make sure you have the time. C'mon it's Bigfoot --a skeptical staple you have to give it its due.